رسولی, رضا, اسفندیارپور, ایمان. (1397). واکاوی مؤلفه های مؤثر بر عملکرد برند در کارخانجات صنایع غذایی. پژوهشنامه بازرگانی, 22(86), 165-188. رضا رسولی; ایمان اسفندیارپور. "واکاوی مؤلفه های مؤثر بر عملکرد برند در کارخانجات صنایع غذایی". پژوهشنامه بازرگانی, 22, 86, 1397, 165-188. رسولی, رضا, اسفندیارپور, ایمان. (1397). 'واکاوی مؤلفه های مؤثر بر عملکرد برند در کارخانجات صنایع غذایی', پژوهشنامه بازرگانی, 22(86), pp. 165-188. رسولی, رضا, اسفندیارپور, ایمان. واکاوی مؤلفه های مؤثر بر عملکرد برند در کارخانجات صنایع غذایی. پژوهشنامه بازرگانی, 1397; 22(86): 165-188. در محیط به شدت رقابتی صنعت موادغذایی حفظ و توسعه سهم بازار نتیجه عملکرد برند است. 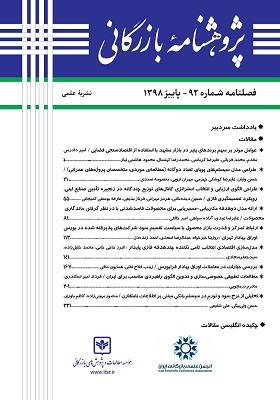 شناسایی عوامل اثرگذار بر عملکرد برند موضوع مهمی در تصمیمات راهبردی بازاریابی تلقی میشود.این مطالعه با استفاده طرح پژوهش از نوع توصیفی و تحلیلی و از شاخه همبستگی انجام شدداده ها از طریق پرسشنامه 35 سوالی از 56 مدیران کارخانجات صنایع غذایی در شهر اصفهان جمع آوری شد. بر اساس ادبیات تحقیق مدلی برای نشان دادن تأثیر سرمایه های ناملموس بر قابلیت های مدیریت و تاثیر مشتری مداری و بازاریابی داخلی بر بازارگرایی و تاثیر قابلیت های میدیرت و بازارگرایی به عملکرد برند طراحی و با استفاده از نرم افزار پی ال اس(PLS) مورد آزمون قرار گرفت. براساس نتایج حاصل از تجزیه و تحلیل داده های پرسشنامه ، مشخص شد که سرمایه انسانی وسرمایه اطلاعاتی اثر مثبتی بر قابلیت های مدیریت دارد و سرمایه ارتباطی و سرمایه سازمانی تاثیری بر قابلیت های مدیریت ندارد. مشتری مداری و بازاریابی داخلی تاثیر مثبت بر بازارگرایی دارد. در نهایت قابلیت های مدیریت برند و بازارگرایی تاثیر مثبتی بر عملکرد برند دارد. Maintaining and developing market share is the result of the brand in highly competitive environments of Food industry. Identifying the effective factors on the performance of brand is a main subject in strategic decisions of marketing. The study was done by the using an analytical-descriptive research design and correlation type. Data were collected in the Isfahan city through a questionnaire of 35 questions from 56 managers of food industry factories. Based on the literature, a model was tested to show the impact of intangible assets on management capabilities and the impact of customer and internal marketing on market orientation over design of brand performance and using the software PLS. Based on the results of the analysis of questionnaire data, it was found that human capital, information capital has positive effect on the management capabilities and communication capital and organizational capital dose not have management capabilities. Customer and internal marketing has a positive impact on market orientation. Finally, brand management capabilities and market orientation has a positive impact on brand performance. ابزری، م.؛ ب. رنجبران؛ س. فتحی و ح. قربانی (1388)؛ »تأثیر بازاریابی داخلی بر بازارگرایی و عملکرد سازمانی در صنعت 25 ـ هتلداری»، چشم‌انداز مدیریت، ش. 31، ص. 42. بحرینی‌زاده، منیجه (1385)؛ «مدلی برای ارزش‌گذاری علائم تجاری از دیدگاه مصرف­‌کنندگان». فصل‌نامه علوم مدیریت ایران، ش.4. پورامید، بهناز (1391)؛ « ارزیابی عوامل مؤثر بر ارزش ویژه برند محصولات لوازم خانگی پارس خزر از دیدگاه مصرف‌کنندگان خانم». پایان‌نامه کارشناسی ارشد، تبریز، دانشگاه آزاد اسلامی. خدابخش گرگانی، فاطمه (1389)؛ «تأثیر بازاریابی داخلی بر رضایت مشتریان شعب شرکت‌های بیمه ایران در سطح شهر تهران»، پایان‌نامه کارشناسی ارشد، دانشگاه علامه طباطبایی، دانشکده حسابداری و مدیریت. دیواندری، ع.؛ م. حقیقی؛ ا. الهیاری و ت. باقری (1388)؛ «بهبود ارزش ویژه برند مبتنی بر مشتری توسط ایجاد تصور از مزیت‌های کارکردی و غیر کارکردی»، چشم‌انداز مدیریت، ش. 30، ص48. سید جوادین، سید رضا و راحیل شمس (1386)؛ «عوامل تعیین‌کننده ارزش ویژه برند کفش ورزشی در میان گروه سنی جوانان»، پژوهشنامه علوم انسانی و اجتماعی، ش. 25، ص 74. عباسی، محمدرضا و صبور صالحی (1389)؛ «اثر بازاریابی داخلی بر مشتری‌مداری در صنعت بیمه مورد مطالعه: شرکت‌های بیمه در سطح شهر تهران»، پژوهشنامه بیمه (صنعت بیمه سابق)، سال بیست و ششم، ش. 2، شماره مسلسل 102، ص 145. مشبکی، اصغر و ابوذر زنگویی نژاد (1387)؛ «طراحی مدل هوشمندی رقابتی مبتنی بر هوشمندی رقابتی ساختاری سازمانی»، فصلنامه پژوهشنامه بازرگانی، ش. 49 ، صص 179-171. نجف بیگی، رضا و آزاده اردشیری چم (1389)؛ «ارزیابی قابلیت‌های نام تجاری در صنایع غذایی کشور»، فصل­نامه علوم، ش.21. یزدانی، حمیدرضا؛ علی زارع میرک­آباد؛ محمدحسین نصیری و مهدی اسدنژاد (1390)؛ «بررسی رابطه مشتری­‌گرایی و رفتار شهروندی سازمانی»، مجله چشم‌انداز مدیریت بازرگانی، ش.6. Aaker, D. A. & K. L. Keller (1990); “Consumer Evaluations of Brand Extensions”, The Journal of Marketing, pp.27-41. Agarwal, S.; M. Krishna Erramilli & C. S. Dev (2003); “Market Orientation and Performance in Service Firms: Role of Innovation”, Journal of Services Marketing, no.17(1), pp.68-82. Bahadir, S. C.; S.G. Bharadwaj & R. K. Srivastava (2008); “Financial Value of Brands in Mergers and Acquisitions: Is Value in the Eye of the Beholder?”, Journal of Marketing, no.72(6), pp.49-64. Dimofte, C. V.; J. K. Johansson & R. P. Bagozzi (2010); “Global Brands in the United States: How Consumer Ethnicity Mediates the Global Brand Effect”, Journal of International Marketing, no.18(3), pp.81-106. Drucker, P. F. (1984); “The Discipline of Innovation”, Harvard Business Review, no.63(3), pp.67-72. Eisingerich, A. B. & G. Rubera (2010); “Drivers of Brand Commitment: A Cross-national Investigation”. Journal of International Marketing, no.18(2), pp.64-79. Fornell, C. & D. F. Larcker (1981); “Evaluating Structural Equation Models with Unobservable Variables and Measurement Error”. Journal of Marketing Research, pp.39-50. Fuchs, C. & A. Diamantopoulos (2010); “Evaluating the Effectiveness of Brand-Positioning Strategies from a Consumer Perspective”. European Journal of Marketing, no.44(11/12), pp.1763-1786. Griffith, D. A. & R. F. Lusch (2007); “Getting Marketers To Invest in Firm-specific Capital”. Journal of Marketing, no.71(1), pp.129-145. Hair, J. F.; W.C. Black; B. J. Babin; R.E. Anderson & R.L. Tatham (2006); Multivariate Data Analysis (Vol. 6). Upper Saddle River, NJ: Pearson Prentice Hall. Hitt, M. A.; L. Biermant; K. Shimizu & R. Kochhar (2001); “Direct and Moderating Effects of Human Capital on Strategy and Performance in Professional Service Firms: A Resource-based Perspective”. Academy of Management Journal, no.44(1), pp.13-28. Hughes, P. & R. E. Morgan (2008); “Fitting Strategic Resources with Product-Market Strategy: Performance Implications”, Journal of Business Research, no.61(4), pp.323-331. Keller, K. L. (2003); “Brand Synthesis: The Multidimensionality of Brand Knowledge”. Journal of Consumer Research, no.29(4), pp.595-600. Kidwell, B.; D. M. Hardesty & T. L. Childers (2008); “Consumer Emotional Intelligence: Conceptualization, Measurement, and the Prediction of Consumer Decision Making”, Journal of Consumer Research, no.35(1), pp.154-166. Lai, C. S., Chiu, C. J., Yang, C. F., & D. C. Pai (2010); “The Effects of Corporate Social Responsibility on Brand Performance: The Mediating Effect of Industrial Brand Equity and Corporate Reputation”, Journal of Business Ethics, no.95(3), pp.457-469. Lings, I. N. & G. E. Greenley (2010); “Internal Market Orientation and Marker-orientation Behaviours”, Journal of Service Management, no. 21 (3), pp. 322-324. Macrae, C. (1996); “Re-thinking Brand Management: The Role of 'Brand Chartering'”. Marketing Intelligence & Planning, no. 14(7), pp. 46-55. Morgan, N. A., Slotegraaf, R. J. & D. W. Vorhies (2009); “Linking Marketing Capabilities with Profit Growth”, International Journal of Research in Marketing, no.26(4), pp.284-293. Nath, P. & V. Mahajan (2011); “Marketing in the C-suite: A Study of Chief Marketing Officer Power in Firms’ Top Management Teams”, Journal of Marketing, no.75(1), pp.60-77. O’Cass, A. & L. V. Ngo (2007); “Balancing External Adaptation and Internal Effectiveness: Achieving Better Brand Performance”, Journal of Business Research, no.60(1), pp.11-20. Orr, L. M., Bush, V. D. & D. W. Vorhies (2011); “Leveraging Firm-level Marketing Capabilities with Marketing Employee Development”, Journal of Business Research, no.64(10), pp.1074-1081. Özsomer, A. (2012); “The Interplay between Global and Local Brands: A Closer Look at Perceived Brand Globalness and Local Iconness”, Journal of International Marketing, no. 20(2), pp.72-95. Özsomer, A. & S. Altaras (2008); “Global Brand Purchase Likelihood: A Critical Synthesis and an Integrated Conceptual Framework”, Journal of International Marketing, no.16(4), pp.1-28. Pimpakorn, N. and G. P. Patterson (2010); “Customer-Orientation Behavior of Front-line Service Employees: The Need to Be Both Willing and Able”, Australasian Marketing Journal, vol. 18, pp 57-65. Schmidt, F. L., Hunter, J. E., Outerbridge, A. N. & S. Goff (1988); “Joint Relation of Experience and Ability with Job Performance: Test of Three Hypotheses”, Journal of Applied Psychology, no.73(1), pp.46. Thelen, S. T., Yoo, B. & V. P. Magnini (2011); An Examination of Consumer Sentiment toward Offshored Services”, Journal of the Academy of Marketing Science, no.39(2), pp.270-289. Verhoef, P. C.; P.S. Leeflang; J. Reiner; M. Natter; W. Baker; A. Grinstein & J. Saunders (2011); “A Cross-national Investigation into the Marketing Department’s Influence within the Firm: Toward Initial Empirical Generalizations”, Journal of International Marketing, no.19(3), pp.59-86. Weerawardena, J., O’Cass, A. & C. Julian (2006); “Does Industry Matter? Examining the Role of Industry Structure and Organizational Learning in Innovation and Brand Performance”, Journal of Business Research, no.59(1), pp.37-45. Westjohn, S. A., Singh, N. & P. Magnusson (2012); “Responsiveness to Global and Local Consumer Culture Positioning: A Personality and Collective Identity Perspective”, Journal of International Marketing, no.20(1), pp.58-73.